It's amazing how little documented material has come out so far about the legendary college rock band the Replacements. 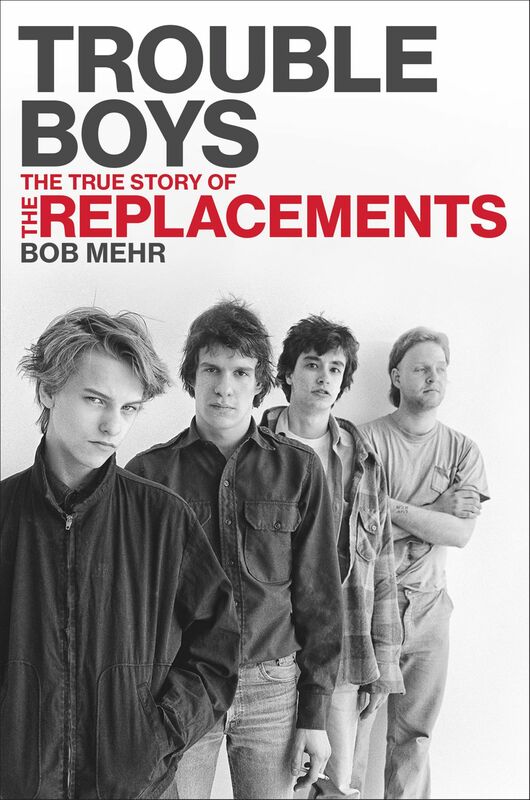 I'm excited to dive into Trouble Boys: The True Story of the Replacements, which was just released. If the emotionally detailed introduction is any indication, telling us the sad tale of the day all the Replacements got back together to attend founding guitarist Bob Stinson's funeral, then this looks like perhaps the best Replacements book yet. Rather than predictably starting with leader Paul Westerberg's backstory, the book transitions nicely into Bob's childhood. His problems are directly attributed to his awful dad and stepdad, who molested him as early as age 7 and wouldn't let him in the house most of the time. I also never knew that Bob's younger brother Tommy, the Mats bassist, had different fathers, and Tommy is a Stinson only because his mother Anita never technically divorced Bob's father. Chapter 2 switches over to Paul's childhood. He was born on December 31, 1959, making him a "child of the 50s" and helping on the "income tax deduction," as would later be noted in the classic song Bastards of Young. His father and grandfather had fought in the world wars and his dad, Hal, had been assigned to pick dog tags and wedding rings off soldiers blasted to bits on the beach at Normandy. He had always dreamed of becoming a professional golfer, but ended up working at a car dealership most of his career, with a healthy bit of business skepticism built in that was clearly passed along to Paul. Paul's friend Scotty was a bad influence who got Paul trying out cigarettes in kindergarten. At 13, he had his first swig of vodka and it flushed all his anxieties away. Alcohol immediately became his go-to for the next many many years. And perhaps some of the great lyrics and music that he has invented over the years can be attributed to a couple of whacks to the head he took as a child. When he was 20 months old, his sister accidentally hit him in the head with a baseball bat, and when he was 9, he fell off a rope in a junk yard and gave himself a permanently Spock-like pointed ear. Years later, before going into the studio, Paul would scream at the top of his lungs to get his voice to sound hoarse, like in the Rod Stewart album he had absorbed when he first started buying records around 1972. I can definitely hear that influence, in hindsight. Same messy hairdos too. Returning to the Stinson story in Chapter 3, they had moved back to Minneapolis after stints in California and Florida, and Bob was not doing well. He wanted to return to Florida to kill his stepdad, he cut himself with razors, and social-work reports from the time show that he may have been suicidal. As his mom's new fiancée threatens to send him to a boys home, his sister Lonnie tells Anita about the molestation and abuse Bob suffered from his stepdad and that this is the source of all Bob's problems. Bob still ends up spending a chunk of his teen years away at boys homes before returning to Anita's house when he was 18 and ready to start rocking in bands. And speaking of Rod Stewart and his band The Faces, Westerberg saw their last concert ever and it changed his life, solidifying his aim to become a full-time rock n' roller. Can't wait to receive this book in the mail so I can read beyond Amazon's free sample.